And we survived Hurricane Sandy. As a native of the Gulf Coast, I've lived through many hurricanes. But I must say, this was the worst I've seen. Our hearts are broken for those who lost their homes and loved ones. But what's uplifting is seeing the way the good people of the East Coast have pulled together in the aftermath. We rode out the storm on the Upper West Side. Fortunately, we didn't lose power, but after 2 days indoors with an 11-month-old, anyone would go stir crazy, right? Right! 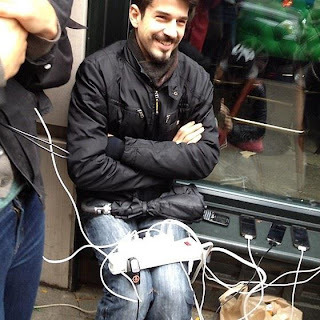 In the meantime, check out this most heartwarming photo, of a guy who set up a station after the storm, so strangers could charge their cell phones!